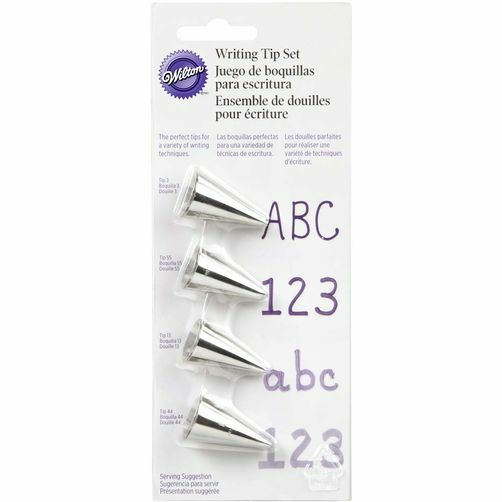 Go beyond the basics with a set of decorating tips that make it easy to add creative lettering to your cakes and cupcakes with the Wilton Writing Tip Set. Use this set of four tips and basic decorating techniques to quickly and easily write names, greetings, messages and more using buttercream icing for your cake or other treats using buttercream icing. Whether you want fine or bold letters, star tip letters or flat ribbon-like letters, this set can help you write and add details to your cakes, cupcakes and cookies. Included in this set are tips 3, 55, 13 and 44. Go beyond the basics with a set of decorating tips that make it easy to add creative lettering to your cakes and cupcakes. Use this set of four tips and basic decorating techniques to quickly and easily write names, greetings, messages and more using buttercream icing. 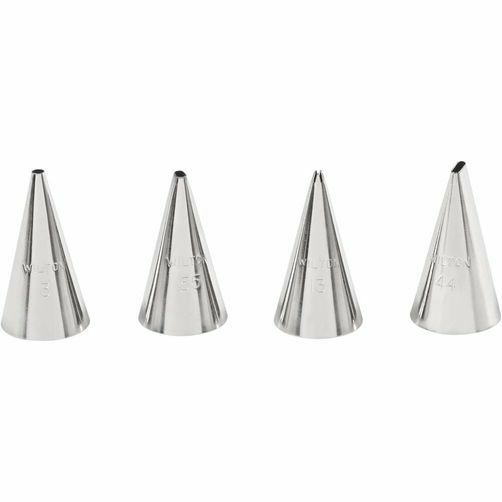 Make fine or bold letters, star-tip letters or flat ribbon-like letters to add messages to your cakes, cupcake and sweet treats. Included in this set are tips 3, 55, 13, 44.